You can now specify a Service Type booking length to calculate by Days rather than just by Nights. Doing so enables you to enter bookings based on the way the service is sold. An example is Rental Cars are sold per Day, while Accommodation is sold by Nights. Rental car bookings are sold at a daily rate and in day-range bands. Each band represents the number of days a traveller can hire the vehicle, and the rate is the cost per day. For example, the rate for a Manual Economy Toyota Yaris is $85 for 1-3 days, $82 for 4-6 days or $77 for 7-13 days. If you’d like to start using the Rental Car feature, please contact your Customer Success Executive or the Tourwriter Support team. There are three new columns added to the Tools > Setup > Service configs screen. 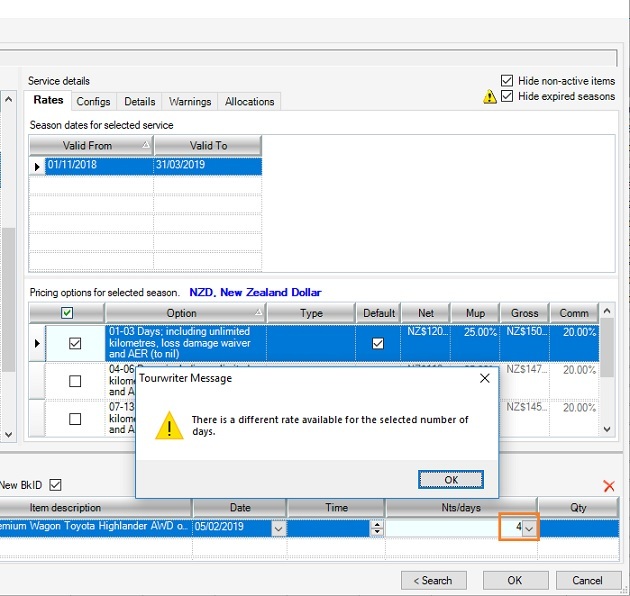 Specifies whether a Service Type’s booking length is calculated by Days or Nights. You can quantify the services in the Nts/Days column. If this is checked, the checkbox next to the End Date is checked by default in the Booking Editor. If this is checked then the number or days/nts is calculated in 24-hour intervals. The Service Type which has days enabled has two new fields added, To and From. 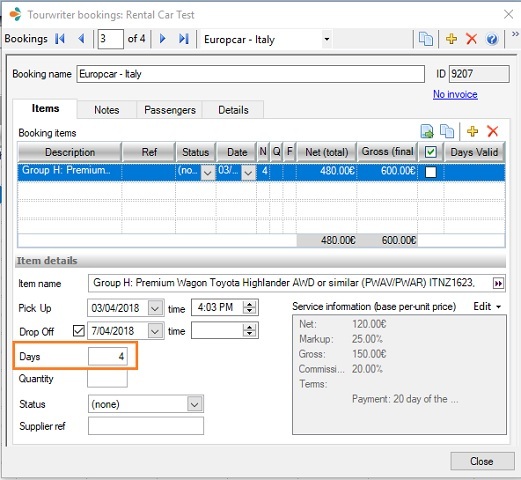 These fields allow you to add a date range for a Service Option to specify the days that the Rental car option would be available. Add the From and To values for each pricing option as shown above and repeat it for all the Rental Car services. To book a rental car for the duration desired, select the right pricing option. Here’s a scenario illustrating a wrong option choice. Drag & drop a Rental Car service to the itinerary. Let’s say you add the “Premium Wagon Toyota Highlander” to the itinerary. Next, if you add a value of 4 Days after you select the option 01-03 Days, you receive a warning message notifying that a different option is available for the day chosen. You can still enter a value outside the day range by closing the warning box. However, a red warning sign appears on the itinerary if the chosen rate does not match the corresponding day range. Note: The warning sign can also be seen when a booking date does not match the rates set up at the Supplier level. To confirm the warning relates to a Rental car booked outside the available day range, hover over the warning sign.